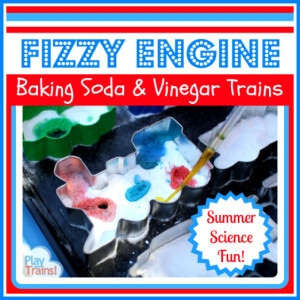 Today, I have two things to share with you: a fun beach activity that combines creativity, science, and sensory play, and the inspiration for it, a great series of train books for kids of any age! 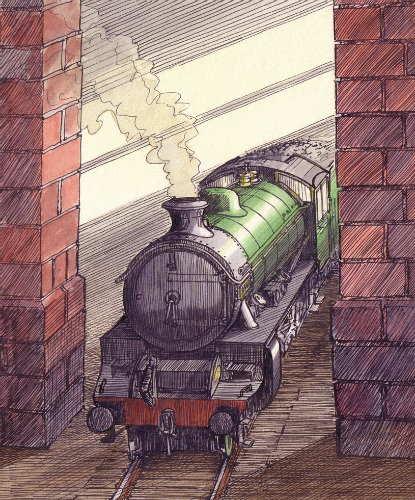 From what I’ve seen, it can be difficult to find many books about trains that will appeal to school-aged children. Just as difficult, I suspect, as it has been for me to find chapter books that are appropriate for the gentle-souled Little Engineer. Having hit upon a way to stretch his attention span to let him enjoy longer and longer books at an early age, I quickly found myself at a loss for what to read to him when even Winnie the Pooh proved too distressing. I don’t think I can express how thrilled I am to have found the perfect series to read aloud to the Little Engineer, though I’m certainly going to try. 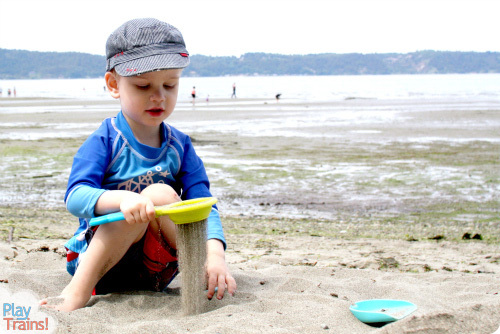 It has inspired a lot of activities, pretend play, and creative thinking in our family, including a wonderful afternoon of learning and fun at the beach. The giveaway prizes were provided by the author, but I received no personal compensation for this post. I just really, really love these books and want more kids to read them! This post contains links to Amazon.com. If you click on one, we will receive a small commission — at no additional cost to you — on anything you buy at Amazon for a certain length of time afterwards. Read our disclosure policy for more details. Earlier this year, I happened upon the website for Peter’s Railway, a series of books about a boy who builds and runs a miniature steam railway with his grandpa. Finding a train book that we haven’t already read is exciting enough, but here was a whole series of chapter books about trains for us to read! I was especially excited to see the examples of the “How it Works” pages, which explain and illustrate the mechanical concepts behind what is happening in the story. The Little Engineer loves any book that goes into detail about how trains work, but we had yet to find one that explained things in enough detail to satisfy him. 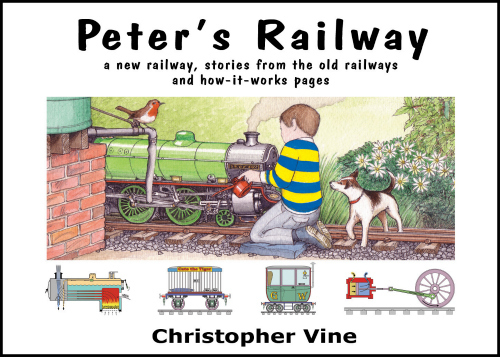 Chris Vine, the author and an engineer with a life-long love of railways, wrote the series to fill the need for books for older children who love trains. After having a look around his website, I took a chance on ordering the hardcover series instead of the shorter books he’s written to accompany it, hoping that they would work for the Little Engineer. To say that the books lived up to this hope would be a complete understatement. The day after we received our copies from the UK, I had to write a message to the author to tell him that his books were officially the first books to inspire my son to negotiate a later bedtime just to hear the next chapter. For the past few months, we have been visiting the railway between Grandpa Gerald’s home at Crossacres Farm and Peter’s at Woodland Cottage. When we get to the end of one book, we start the next. And when we reach the end of the series, we start at the beginning again. Often, we’ll be reading two or more of the books at a time, having left different ones at different reading spots around the house! What is really special about these books is rather than relying on suspense and tension between characters, what draws you through the story is being immersed in the fantasy of building a railway with a grandfather with whom you have a special connection. Looking back on my own favorite childhood books, it wasn’t what happened next that made me want to read them over and over. It was the fantasy of being a pioneer girl like Laura Ingalls Wilder or traveling through Narnia with Peter, Susan, Edmund and Lucy that brought me back to those books. And that’s what’s bringing not just the Little Engineer, but me back to the Peter’s Railway books. I want to read them over and over again, to imagine not just my son getting to do something so cool with his grandpa, but my having gotten to do that, too. And it doesn’t hurt that bringing that dream to life are the beautiful illustrations that appear on most pages, like the one of their engine, Fiery Fox, below. While there are certainly exciting scenes in the Peter’s Railway books — and a few “close shaves” as Peter’s grandma would call them — nothing really bad ever happens to the characters. This allows the books to be read to any child willing to sit (more or less) still to listen, while older kids will get caught up in a dream of making train tracks and learning to drive a real steam engine and not wish for more danger or bad behavior from the characters. The only exception to this are a few of the stories from the old days of the railway that Grandpa Gerald tells to Peter. The first time through, I skimmed those stories before reading them aloud. Other than one story that takes place during the war, I gave the Little Engineer a quick description of what it was about and let him choose if I read that story or passed over it. At first, he skipped most of the stories, but by the time we got to the second book, he wanted to hear them all. The layered presentation and depth of the technical information also makes this a wonderful series for either age group. The facts are introduced in the story, with Grandpa or another character explaining them to Peter in the course of the story, and then illustrated and explained in more detail on the technical pages. This approach makes learning about how everything works easier and very enjoyable. Reading the technical pages isn’t necessary to enjoy the story, and we skip some of them now that we’ve read the books so many times. But for an interested older child, these pages would be treasures to read over again and again. The Little Engineer knows so much about railways now, all thanks to reading Peter’s Railway. 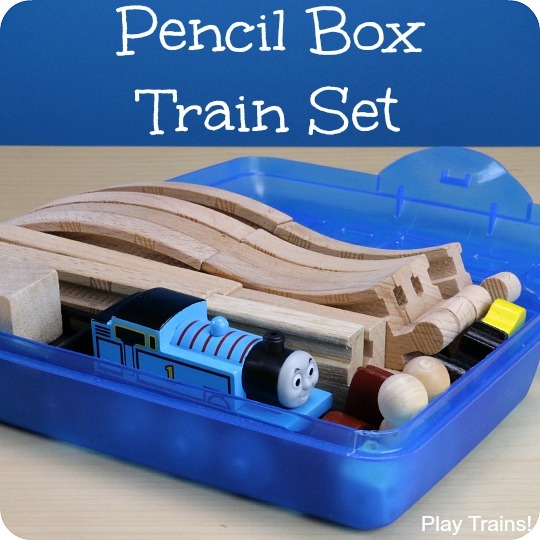 He’s gone from using words like “boiler”, “funnel”, and “pistons” in his play to adding ones like “fire tubes”, “ballast”, and “fish plates”. Many of the concepts he’s learned about through the books have inspired the stories he tells. He was especially excited to learn that engines have springs attached to their buffers and coupling hooks, and to hear the story of the Puffing Devil in the third book. For days, all he could talk about was his “uncrashable” engine that would be protected by the springs on its coupling hooks, and whether or not his engine would have a safety valve to keep it from exploding like the Puffing Devil. There have been unexpected benefits to reading the books, as well. The Little Engineer is lucky enough to get to spend time with both sets of his grandparents every week. Over the last few months, he’s discovered his own grandpas as playmates. 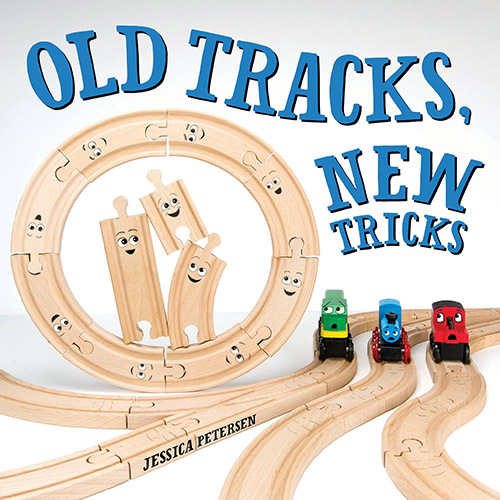 When he recently asked to bring the first book of Peter’s Railway for my father-in-law to read to him, along with the supplies for building his pool noodle train tracks, I realized that our favorite books probably had something to do with this. The occasional page without any pictures has helped him to develop the patience to simply listen to the story, knowing that when we turn the page, there will be another beautiful illustration to gaze at as the story continues. I also really appreciate the attitude Peter and Grandpa Gerald have toward their work and life in general. The idea of taking pride in a day of hard but productive work is illustrated again and again through Peter’s experiences. Grandpa Gerald shows Peter the possibilities for reusing old but still useful parts to make something new and wonderful. And I love that the pair come up with grand plans and follow through on them. In addition to building the railway in the first book, in the second book they add a turntable and a turning loop at either end of the line, in the third book they add automatic brakes to the wagons behind the engine, refurbish an old steam traction engine and extend the line to a nearby village, and in the fourth book they build a snowplow and a water wheel. We can’t wait to see what they do in the fifth book! We are now awaiting the delivery of the newly-published fifth book in the series, along with all of the shorter paperback books and the activity book. I know we will love them just as much as we’ve loved the ones we already have. 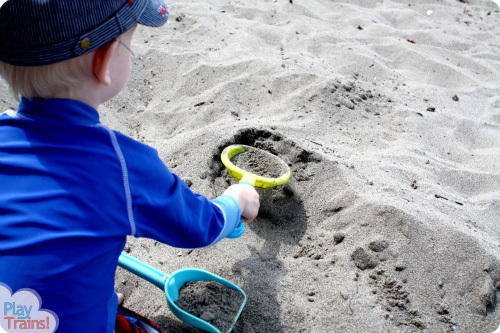 We started making hills and hollows, digging cuttings and mounding embankments in our sandbox. 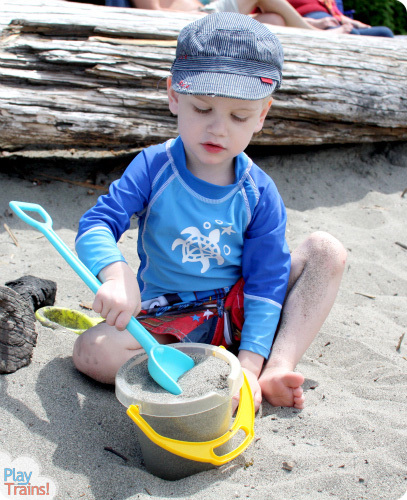 That was so much fun, I knew I needed to bring some railway building tools with us to the beach on Father’s Day. First, we made some hills and valleys together. 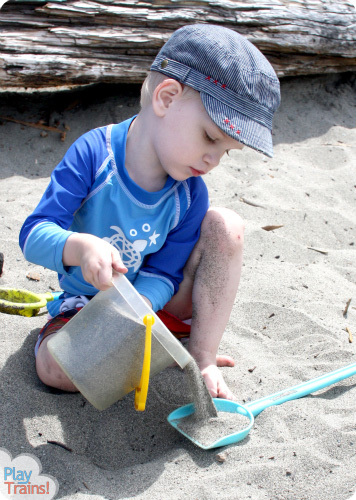 The Little Engineer spent a lot of time scooping with his shovel, filling his bucket, pouring and dumping sand. He seemed quite absorbed by the sensory aspects of the experience, so I let him work on one hollow while I created a couple of hills and another valley between them. Once we decided the hills were high enough and the valleys deep enough, we carefully began digging trenches through the hills and using the sand we removed to create the embankments in the hollows. The technical page explains that often the earth dug out of a cutting is just what is needed to create a nearby embankment, and so it worked out for us. 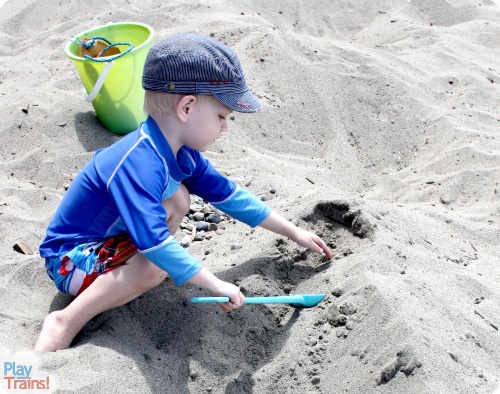 The Little Engineer very carefully loaded his shovel as we did this. He also enjoyed adding more “track bed” with his little handled sifter and then helping me level it out again. 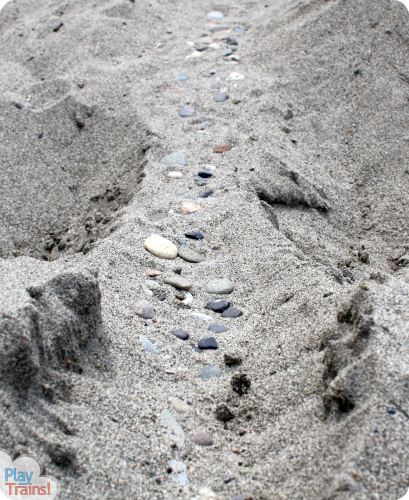 Once our line was level, we started looking for little stones to be our “ballast” and pressed them into the sand. 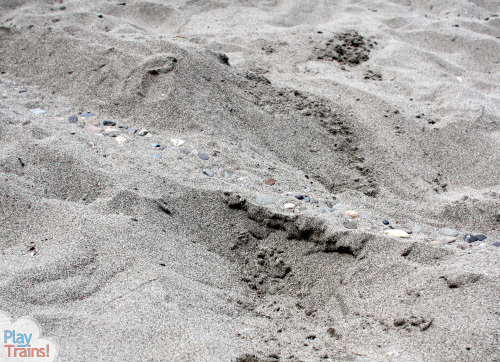 This is when the activity became as much beach art as science. Hopefully, you can see how our railway line goes over an embankment and through a cutting in this photo. It’s a bit difficult taking pictures of things that are all the same color! 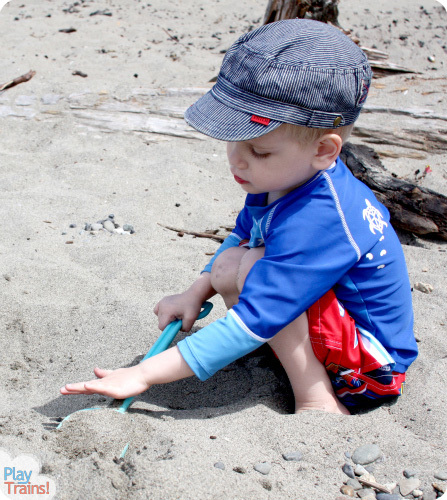 The Little Engineer enjoyed sifting through the sand for more ballast. Soon, we had covered the whole line with ballast. It looked very pretty with the stones dotting the sand. 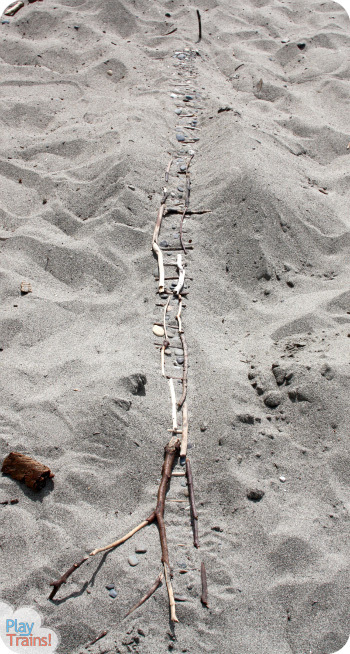 We began finding sticks and driftwood for sleepers — or railroad ties if you want to use the American term — and rails. We both had fun placing the sticks. 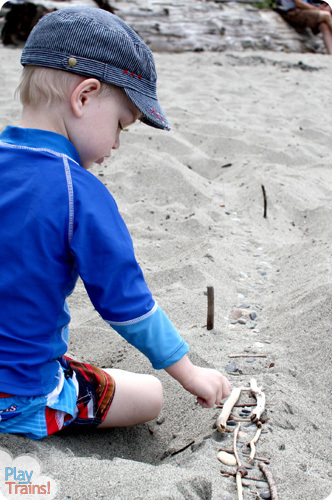 The Little Engineer found a little tiny one and declared it the “golden spike” that would complete the railway. We recently read a book about the building of the Transcontinental railroad, which was finished with such a ceremony, and it was fun to hear him bring that fact into his play. 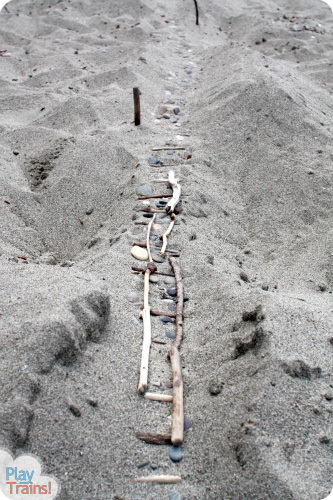 The sticks sticking up out of the sand along the line were supposed to be lights, just like Peter and his grandpa add to their stations in one of the books. 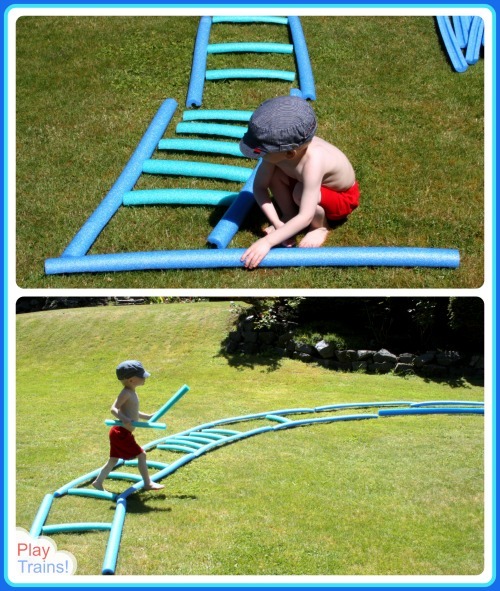 This part of the activity was excellent fine motor practice, as the Little Engineer carefully arranged the rails. As the afternoon wore on, he found a stick with a twig shooting off at an angle and decided to add points (a switch) to the track. 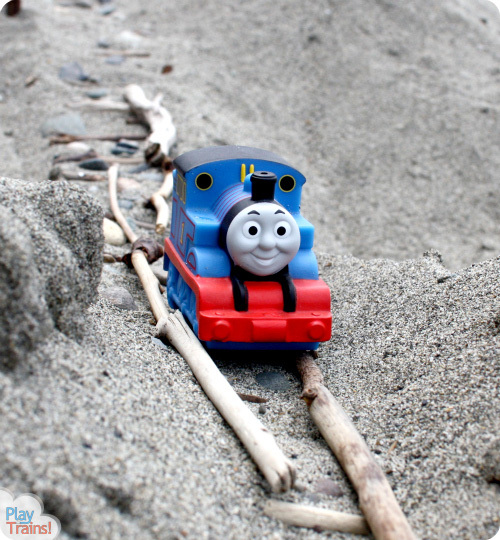 I brought along one of our Thomas bath toys to do a test run of our railway — the sand would ruin a regular toy train if it got into the axles. 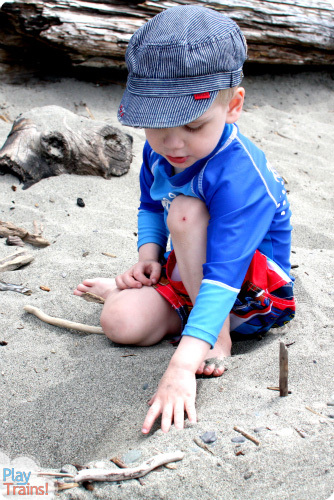 We saw another boy going off to play with two of his Trackmaster trains on the beach. I wanted to shout, “No, don’t do it!” But I managed to restrain myself. I hope they still worked when he got home! In the end, our railway was about five or six feet long. The Little Engineer would have gladly stayed to work on it longer, had his parents and grandparents not been exhausted by that time. He has plans to make another one the next time we go to the beach. 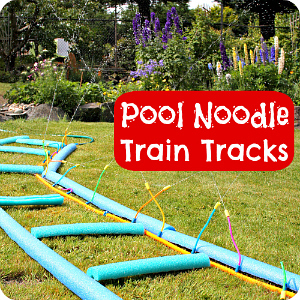 Another activity that was inspired by Peter’s Railway is our Pool Noodle Train Tracks. 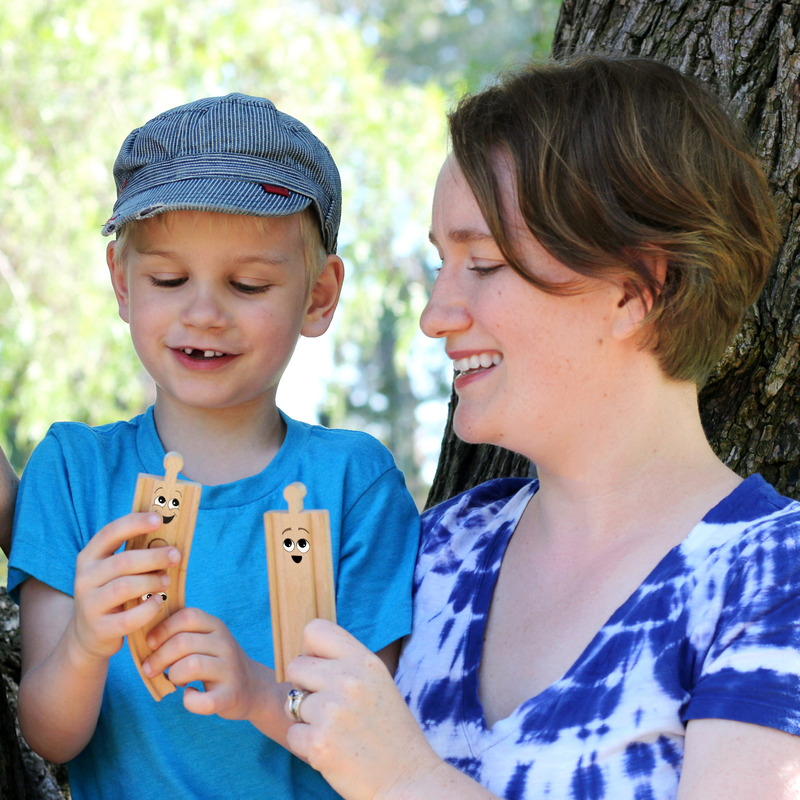 The whole time we were building them, the Little Engineer was pretending to be Peter. 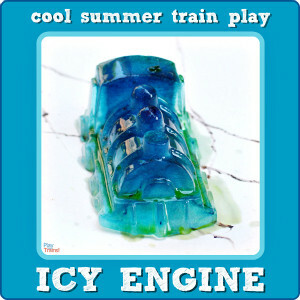 Of course, once they were built and the “engine wash” was added, he switched over to being an engine himself! 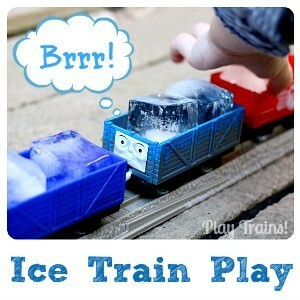 This is a great activity to bring Peter’s Railway outside and into play. 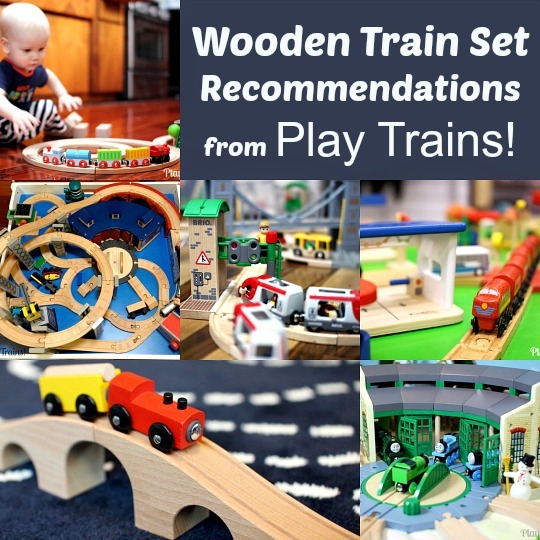 And, in our case, get the Little Engineer up and moving away from his wooden trains for an hour or two! The giveaway has now ended. Congratulations to the winners! The day after we got our set of books, I wrote Chris Vine a message of thanks, letting him know how much the Little Engineer loved the books. I also told him a bit about Play Trains! and the purpose behind it, and he wrote back suggesting we collaborate on a giveaway. I was thrilled, because I’d love to help get these books into the hands of little engineers in the United States. There are four prizes for the giveaway: two are copies of the first hardcover book in the Peter’s Railway series, and two are copies of one of the paperback Peter’s Railway books (the winners can pick which one they want). The first two names I draw will get the hardcovers, and the second two will get to pick out a paperback book. Please note that the giveaway is only open to US residents, 18 years of age and older. Full details and rules are available in the giveaway widget below. I hope all of our readers in the US will enter this one! 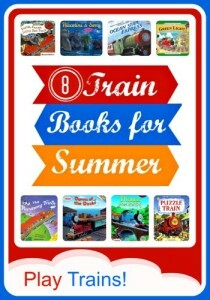 The books are perfect for summer reading, because Peter and his grandpa work on the railway while Peter is off from school during the summer holidays. Wherever you live, please go over to visit Chris at the Peter’s Railway website. There are lots of fun things to see, and you can learn all about the books. my little guy loves talking about train parts. 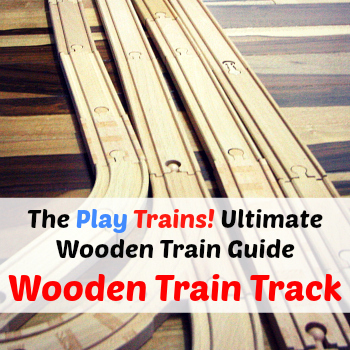 we’d love to take these books to visit the chattanooga choo choo! 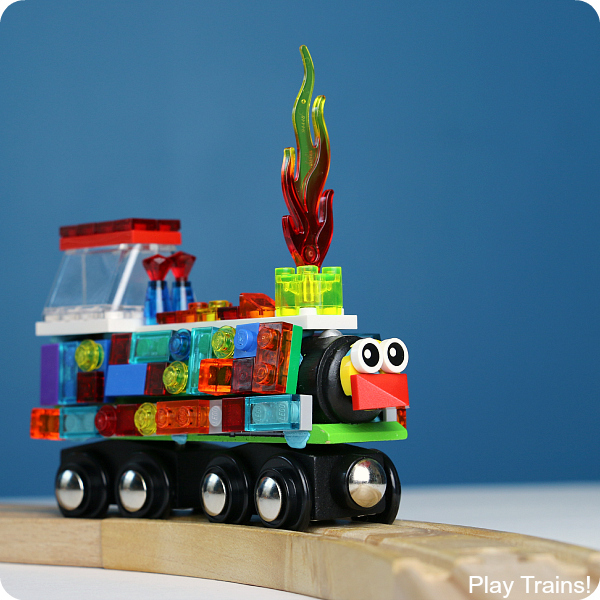 Your creativity around trains is boundless! Stories and trains are probably Cr’s favorite things in the world, and stories about trains are the best. But I agree, it’s hard to find good ones sometimes. Peter’s Railway sounds like a great option. What amazing books! 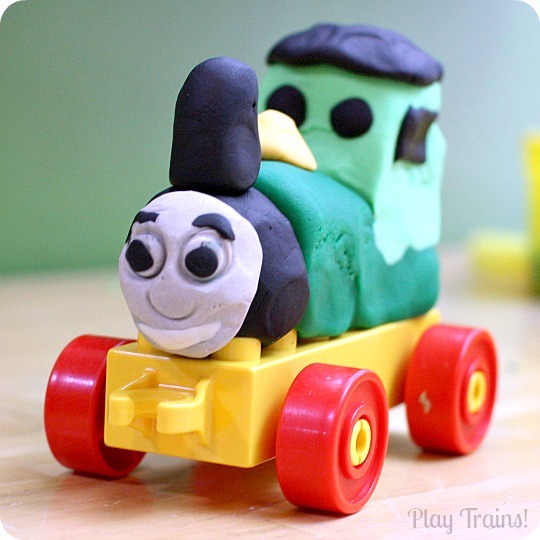 I love your train the beach activity so much I pinned it. Thanks for sharing at Stress-Free Sunday — I’m featuring you this weekend! Right on! 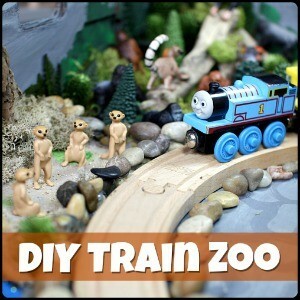 Browsing through this blog is getting me all stoked for train-related activities I can do with my kids. Thank you! What a fantastic set of books to read with my 3, soon to be 4, little boys! This book looks great and so informative. 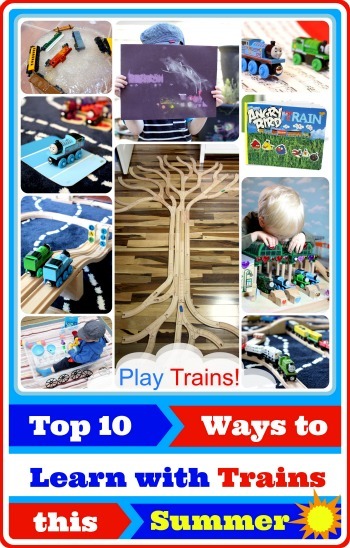 My 6 year-old has really gotten interested in trains, so it would be perfect for him to learn more! I’ve been wanting to dive into chapter books with my little train man, and these sound perfect! The book looks fabulous. I’m going to have to buy it no matter what! Enough of a post for now! 🙂 Thanks! The sand tracks work really well in sandboxes, too! 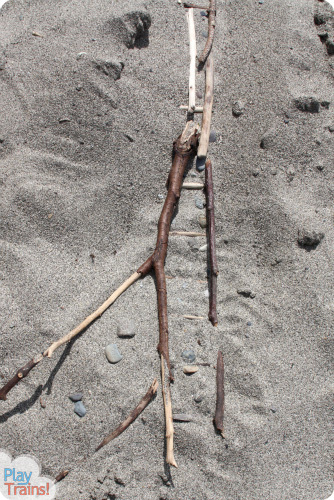 We sometimes use little craft sticks instead of the driftwood and twigs. I meant to reply long ago! I had a long reply on my phone but I lost it somehow. I digress…thank you for your reply and suggestions on what pieces to bring. We are two weeks into our summer away from home and my tot is happy with the number of pieces we brought. He had a great time counting and sorting to pack for the trip. 8 small curves, 8 large curves, etc. We packed it into a vintage Samsonite train case (appropriate name, right?) 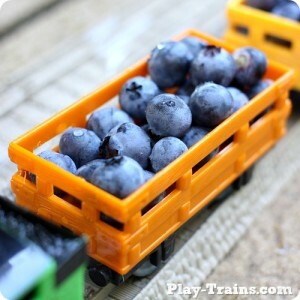 and fit as many train cars as we could into the top plastic compartment. Perfecto! I’m amazed at his creativity and willingness to make pieces out of paper or cardboard, as you suggested, instead of having all of his special pieces. Super fun! Thanks again for your help. Oh, and Rachael is so sweet to have sent you over! I’m glad you’re going to get the book…it really is wonderful. Yay! So glad you found each other. I know Val (and her little boy) will love your blog, Jessica! We enjoy reading and when it’s about trains we love that even more. Trains our a favorite at our house too. We will have to look into these books. They look great! 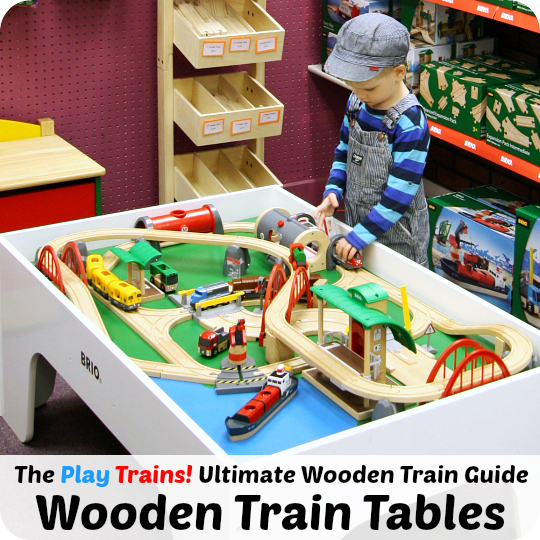 I am so excited to find this website for my train boy!! 🙂 Can’t wait to check out the book series, too! featuring you today in my kids co-op post. This looks like a great series of books. I love how it has already inspired so much play. Tinker spent a good amount of time collecting twigs and making train tracks on our recent vacation. Maybe we’ll try for a whole railway on our next beach visit. Thanks for linking up to Discover & Explore. I’m featuring this post today. 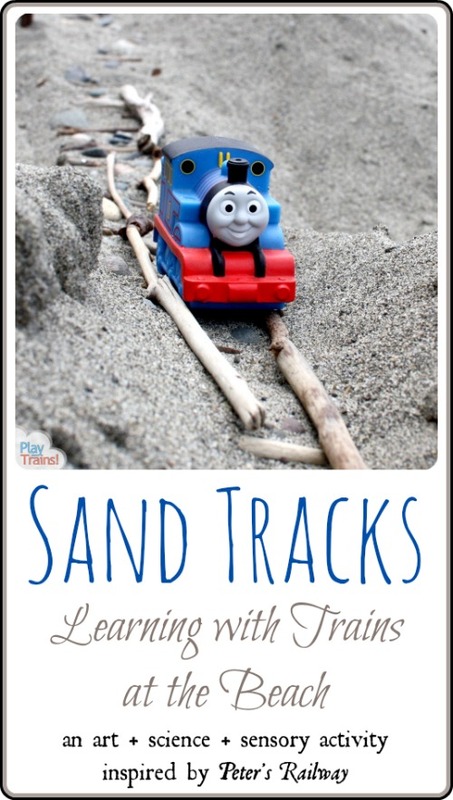 What could be better than playing trains in the sand? That has to be a little boys dream come true.